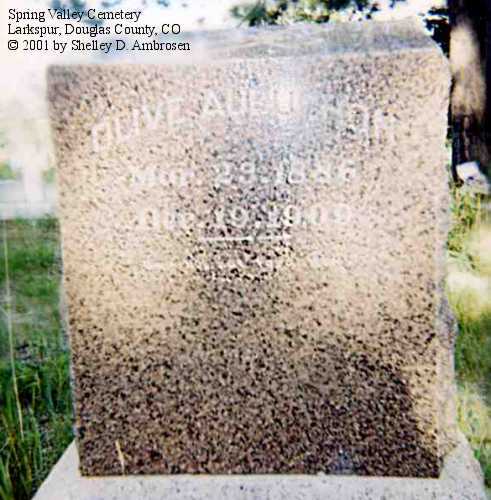 Spring Valley Cemetery is located at 13944 Spring Valley Road, Larkspur (80116), about 4½ miles SE of Greenland. Phone: (303) 688-9149. George Julius, son of Julius H. & Rose Rachel (Lavelett) Aubuchon; born 19 Mar 1901, died 10 Feb 1971; m. 1st Gwen Sharp, m. 2nd Myra C. Clarke. 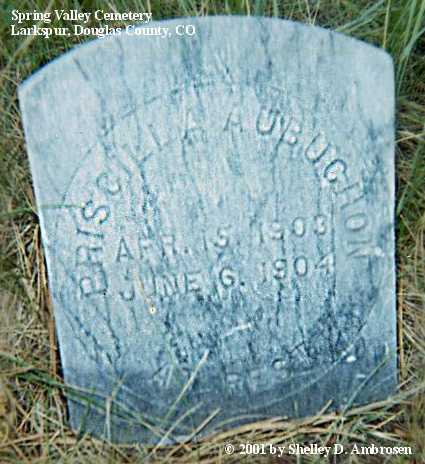 Maria Olivia Lavelett, daug of Michael Francis & Priscilla Mary (Heneaux) Lavelett, also known as Olive M. Aubuchon. 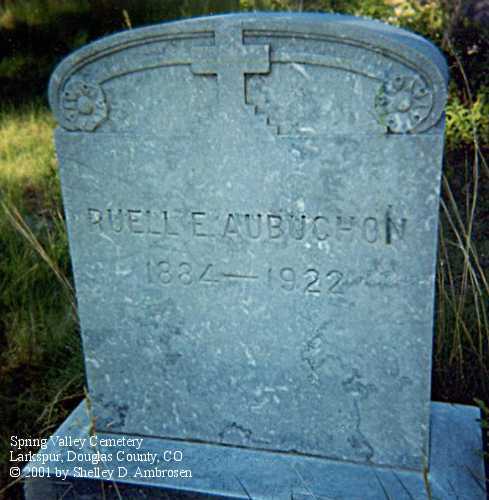 Wife of Ruelle Edwin Aubuchon. Rose Rachel (Lavelett) Aubuchon, daug of Michael Francis & Priscilla Mary (Heneaux) Lavelett; born 3 May 1884, died 20 Feb 1951. 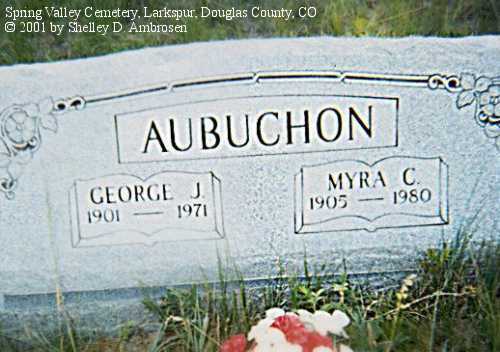 Julius H. Aubuchon, son of Joseph & Celine (Chomeau) Aubuchon; born 1859, died 18 May 1933. 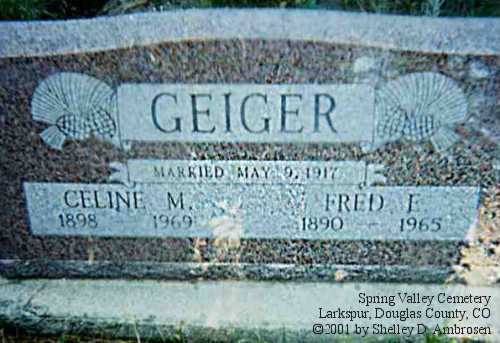 Celine M. (Aubuchon) Geiger, daug of Julius H. & Rose Rachel (Lavelett); born 29 Sep 1898, died ?? Sep 1969. 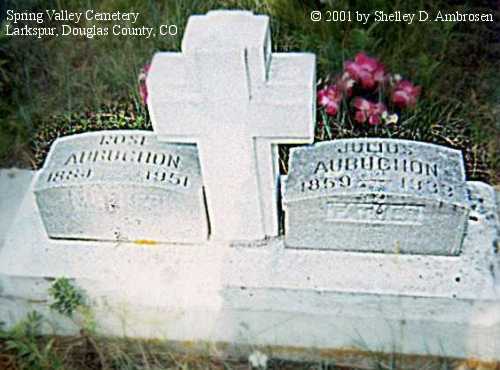 Pricilla Mary (Heneaux) Lavelett, daug of Stephen & Rachel (Bronssean) Heneaux; born 5 Dec 1864, died 22 Aug 1956. 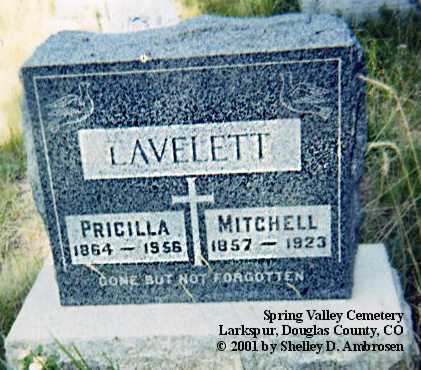 Gravestone "Mitchell"--records show name as Michael Francis Lavelett, son of Francis S. & Lucinda (Montrel) Lavelett; born 7 Dec 1857, died 13 Aug 1923. 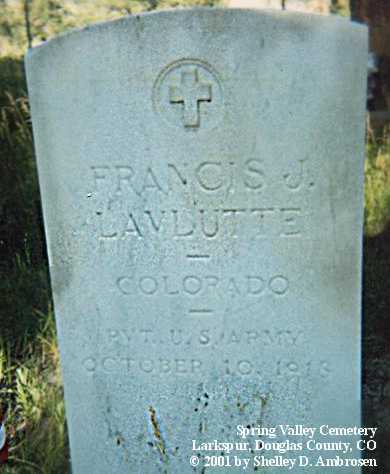 Francis Joseph Lavelett, son of Michael Francis & Priscilla Mary (Heneaux) Lavelett; born 8 Apr 1889, died 10 Oct 1918; m. Hazel Norvel.